I elected to forgo house cleaning for the weekend to get some projects finished instead. My house is sticky and filthy…..but I won’t be throwing my weekly hissy fit about it until later. I am forcing myself to ignore it so I can enjoy myself for once. I finished one of my WIPs from Alabama Chanin (all of her stuff makes me drool……..I want to make every single project in many different colorways and I challenge you to not want to go right out and buy 800 lbs of cotton jersey once you look at her site). This skirt is from the first book, The Alabama Stitch Book. 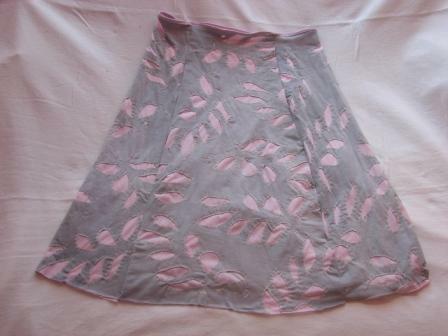 The under fabric is pink and the top fabric I dyed to be a light grey. 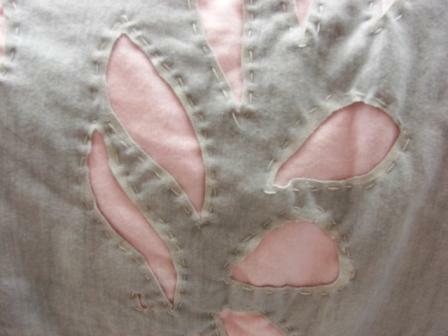 The contrast stitching is in a cream color. Relief appliques. Am totally in love. 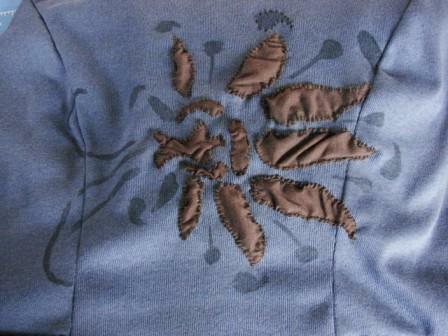 The only snag is that I need some light brown embroidery floss to edge the painted – on stencil bits that don’t get appliqued. I swear I have every other color of it known to man. But not brown. Do I drive half an hour and battle Charlottesville traffic to get some more or do I work on other things today instead? Dilemmas, dilemmas. P.S. We are up to 4 baby chickens that have now hatched. Six eggs left.